Stephanie McMahon has been added to the creative team that writes WWF television. Since returning to WCW after suffering third-degree burns, Bam Bam Bigelow has reported no problems. Jim Neidhart and the British Bulldog will be released shortly by the WWF. Extreme Championship Wrestling owner Paul Heyman said he has no interest in bringing back Sabu. Rob Van Dam will finally be looking to add the ECW world title to his resume when he returns to the company full time. WWF officials are very impressed with Molly Holly, especially after “Smackdown.” Not only can she hit the high spots, but the WWF also considers her a good worker of matches. A WWF Women’s Title run will probably be in the near future. There were a lot of rumors circulating last week about Eric Bischoff taking steps toward developing a start-up promotion. Sources say Bischoff has already contacted Hulk Hogan, Randy Savage and Ultimate Warrior to be part of the group. He also has a WCW employee recruiting talent from within WCW, according to one source who says he was propositioned. Bischoff is said to have had high-level meetings with Fox about airing the promotion. The Dudley Boyz will compete at an upcoming ECW event on Dec. 21 in Queens, N.Y.
Kurt Angle’s brother, Eric, could sign a development contract with the WWF, and if he does, he will be assigned to Ohio Valley Wrestling. Brad Siegel is hoping to cut $16 million off WCW’s budget, say sources, by reworking the contracts of several “mid-card and lower” wrestlers. According to sources within the WCW office, Siegel is planning to exercise the 90-day review clauses in as many contracts as possible. He plans to release those wrestlers, and then attempt to re-sign them to cheaper day-to-day contracts. Never has Ric Flair’s trademark “Woooo!” sounded so good. The grim, borderline-pornographic world of professional bodybuilding – the world that gave us Arnold Schwarzenegger – has been controlled for years by two elderly brothers. 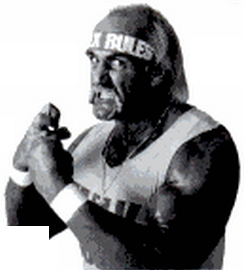 Now Vince McMahon, the, uh, brains behind Hulk Hogan’s crossover stardom, is moving in on the brothers’ turf. IRVIN MUCHNICK reports on the pumped-up, steroid-fueled marketing war between the impresarios who make megabucks. Now she’s just Joanie Laurer. Speaking of WCW, in the time since the organization dropped from the radar screen, I have received a plethora of e-mails concerning its status. I know as much, or as little, as you do. 20/20 Sparked Wrestling Movie’s Woes?